Sarah has been experimenting with how Gracilaria exposed to different temperatures can affect the algae's survival. She is trying to answer the question, "How does exposing Gracilaria to hot and cold temperatures affect its ability to survive?" Sarah collected Gracilaria samples from our mudflat. She planned to complete a series of 3 heat assays and 2 cold assays. Samples are exposed to temperatures between 30-50 degrees Celsius (86-122 degrees Fahrenheit) for time periods of either fifteen or thirty minutes. Samples are put in a freezer at -20 degrees Celsius for varying periods of time, ranging from 5 minutes to 1 hour. Samples exposed to temperatures of ~44 degrees C and above will not survive. Samples exposed to temperatures of 30-34 degrees C are mostly okay. 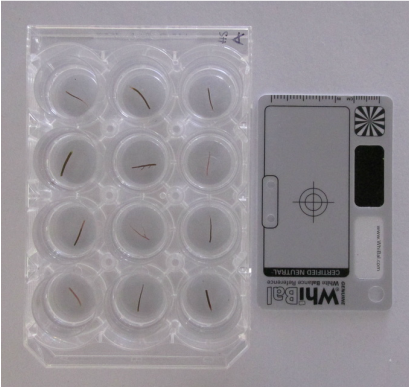 Samples exposed to temperatures in between these showed some variability. ﻿During the experiment, the water that the samples were sitting in froze after just 10 minutes. Gracilaria samples were checked after a week of exposing them to the freezer. The samples that had spent 1 hour in the freezer looked perfectly healthy-so this is a pretty tough seaweed! 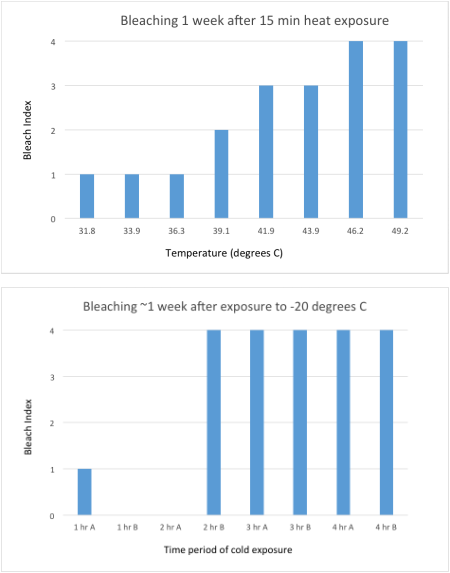 The graphs below represents the range of severity of bleaching that occurred in the Gracilaria samples. A 0 means there was no bleaching and 4 means there was complete bleaching/death. More cold assays will be run with samples in the freezer for up to four hours to see if Sarah can determine how long it takes for Gracilaria to freeze to death. Sarah is also working on a good reliable method for quantifying bleaching. Dr. Sotka will assist her in the process. Because the seaweed that was frozen for up to 1 hour survived, Sarah continued to run another cold assay experiment. Samples were put in freezer for each of the following time periods: 1 hour, 2 hours, 3 hours, and 4 hours. All samples that were frozen for 2 or more hours were dead a week after the experiment. Sarah will next be running another cold assay to try and figure out the time point between 1 and 2 hours at which the seaweed reaches its limit. Samples will be put in a freezer for 45 minutes, 1 hour, 1 hr 15 min, 1 hr 30 min, 1 hr 45 min and 2 hours. There will also be a control group that won't go in the freezer at all. major role in survival to different temperature exposures. She hypothesizes that the genetics of the seaweed may play a greater role. She hopes to get more insight with future research!